Universal Design is an interior design that adapts homes to homeowners, not the other way around. The goal is to make the entire home safe and easy to use. When it comes to kitchens, here’s one design tip that adapts your kitchen to your needs plus transforms it into a dining area with ambiance. You’ll be amazed to see how one small addition to your cabinetry can make such a difference. When it comes to base cabinets, most manufacturers include an indentation to make room for your feet called the toe kick space. Typically 3 inches deep and about 3 1/2 inches high, this space allows people to stand closer to the countertop so they don’t have to lean forward. Standing closer puts less strain on the back, shoulders and arms and minimizes discomfort, posture issues and chronic pain. The addition of light to this space adds both safety and ambiance. First, it clearly defines the break from floor to cabinets. Especially advantageous at night, you minimize the possibility of bumping into things. This definition also aids early morning and evening meal preparation. Another advantage is that lighting placed within the toe kick can’t cause a glare. One goal of Universal Design is to balance lighting. It doesn’t matter if you have 20/20 vision, wear glasses or have a family member with sight issues; too much light is just as dangerous as too little. Foot level lighting balances overhead lighting and the combination eliminates shadows. 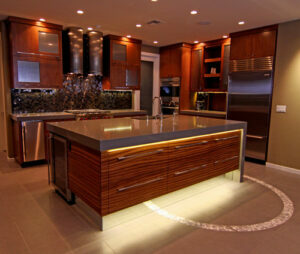 Finally, toe kick lighting sets the ambiance of a kitchen. The soft glow creates an atmosphere that makes your meal more relaxed… and possibly more romantic! Whether it’s a family gathering or an intimate dinner for two, lighting the toe kick space is a safe, beautiful addition to every kitchen.